Simple, fascinating, addictive! This is one of my new favourite games, because it is so beautiful, simple and plays so fast and smooth. 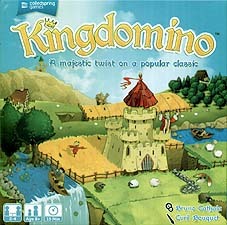 This game is dominoes but with a Carcassonne style twist! The dominoes (nice thick card tiles by the way) have 2 different terrain types and players will score points for building terrains that score. The game also has a nice twist with the way the tiles get laid out and selected, with the descending values meaning that choosing a lower numbered 'domino' means you will get first choice when the next 4 tiles come out - excellent! I have only played this with two, but it was awesome, we played 3 games in a row! I recommend you include the additional rules for scoring in the back of the rule book as this adds a bit more to the game.